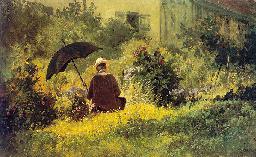 Well known Biermeier painter. His father was a wealthy merchant and he was educated at the University of Munich and apprenticed to a pharmacist. After graduating he fell ill and during his recovery he started painting. After copying old master he started working for satiric magazines. In 1833 he became financially independent after he received an inheritance and from then on he spent all his time painting. In 1840 he started working for "Fliegende Blätter", a comical magazine. His paintings often depicted eccentric characters, like "The Bookworm" (1850). 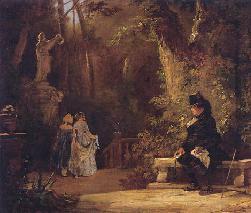 Around 1851 he travelled to Paris, London and Antwerp. He also went to Prague and Venice. Painter Eduard Schleich was a close friend. In 1867 Spitzweg's work was presented at the World Exhibition and in 1868 he became a honourary member of the Academy of Art in Munich. Some of his work is now in the Neue Pinakothek in Munich. 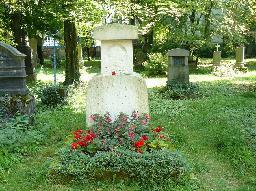 The grave of Carl Spitzweg at the Alte Südfriedhof, München.